The Ultra-Air® Model 735 Red is a compatible alternative replacement septic tank shaft aerator for Jet Aeration systems. The 735 Red model has 12'' top brackets that are designed to fit a 10'' diameter opening. It is a complete compatible replacement for Jet OEM models 660, 665, and 700LL. The Ultra-Air® Model 735 Red is made 100% in the USA. The unit is brand new and comes with a Three Year Limited Warranty! Q: Septic Solutions offers Ultra-Air Model 735 RED and BLUE Models. What is the difference? A: The Ultra-Air Model 735 RED is designed as a compatible alternative replacement aerator for Jet Aeration systems. 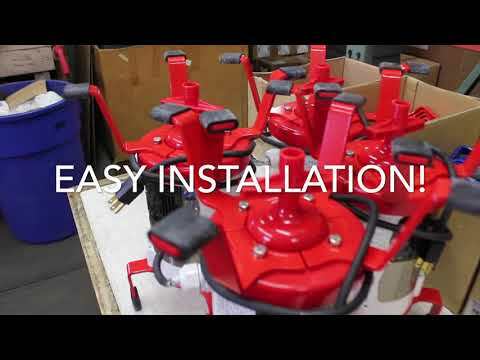 The RED units come with 12'' diameter top brackets and 9.5'' bottom brackets which fit the 10'' diameter motor opening of the Jet brand aeration system. Q: What is the difference between the Standard and Flood Resistant units? A: The Standard unit uses a Baldor 1/4 HP electric motor. This motor is capable of running in the harsh environment of the septic tank, but it is not designed to ever be submerged in water. The White Splash Flood Resistant unit uses the same Baldor 1/4 HP electric motor, but this motor is specially sealed and can withstand being submerged for intermittent periods of time. If you have issues with the system backing up due to an outlet being plugged or a failed submersible pump, we would recommend the Flood Resistant unit. Q: I have a Jet Aerator Model 700LL. Will the Ultra-Air Model 735 RED work as a replacement? A: The Ultra-Air Model 735 RED is a compatible replacement aerator for Jet OEM Models 660, 665, and 700LL. The Ultra-Air Model 735 is compatible with all Jet brand aeration systems, but it is not considered OEM equipment and has not been tested or approved by NSF for use on Jet brand aeration systems. Q: Is the Ultra-Air Model 735 aerator an approved replacement? A: The Ultra-Air Model 735 has not been tested or approved by NSF. Only OEM equipment can carry the original NSF approval. Because the Ultra-Air Model 735 is an aftermarket replacement, it cannot be tested or approved by NSF. Q: Does the Ultra-Air Model 735 come with a cord and plug? A: Yes the Ultra-Air Model 735 motors have a 3 foot power cord with a standard 3 prong male plug. Q: Will the Ultra-Air Model 735 work with my existing control panel? A: Yes, in fact a fully functional control panel is required! The motor itself does not have any type of overload protection, so this protections is provided by a 4-7 amp breaker in the control panel. If the water level in the tank reaches the 6 inch diameter suds restrictor located just below the motor or the motor gets debris wrapped around the shaft, it places an additional amperage load on the motor. That additional amperage causes the motor to trip the 4-7 amp breaker in the alarm panel. Q: Do you sell replacement parts for the Ultra-Air Model 735? A: Yes. See our Replacement Motors page for motor only replacements and see our Replacement Parts page for available parts and components. Q: Should I run the Ultra-Air Model 735 continuously or on a timer? A: We recommend that the Ultra-Air aerator run continuously. In general, the life of the motor is better and the system functions better is the aerator is running continuously. The main reason that motor life is better when the aerator in ran continuously is condensation. When a motor is on a timer its heats up and cools down as it turns on and turns off. When the motor turns off and cools, condensations will build up in the motor and can cause it to fail prematurely.